Get ready for the snow and building family memories while building a Snowman! You can make this snowman kit during nap-time! In the South, we do not get a lot of snow, but when we do we want to make the most of it. I'll never forget last Christmas, we got snow on Christmas day! We had so much snow that we were able to have a snowball fight and build a snowman!!! Last year I scrambled to make a snowman face (luckily Santa brought LilMan and Em bubble gum coal, and Ben big lumps of coal and we had strawberries). However, this year I'm ready! I made another naptime creation. Please respect the copyright on this creation. If you make it, make it for yourself and not for resale, reproduction and/or distribution. If you are interested in resale, reproduction, and/or distribution please contact me at Stephanie@grinninglikeanidiot.com. Click to Download the Snowman Kit Pattern. 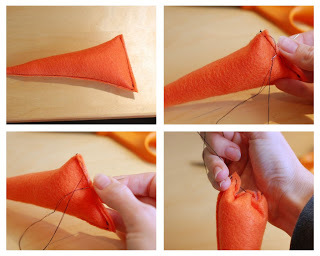 - Fold the cone over, sew the side and trim excess. 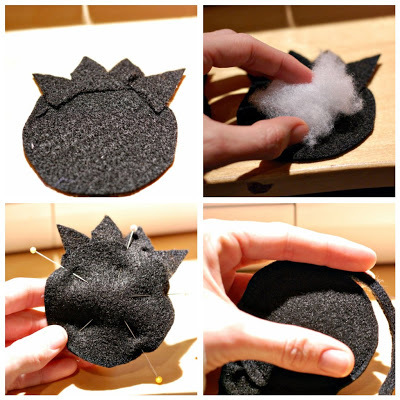 - Stuff with Polyfill and sew up the opening. 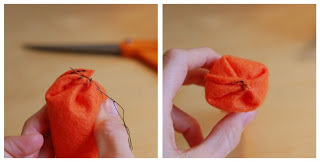 - With needle and thread, whip stitch the corners towards the middle of the closure. - Hot glue the golf tee onto the back. - Place one of the Eyelashes on top of the bottom eye, and baste stitch. - Then place the top eye on top of the bottom, add a pinch of Polyfill and sew around leaving about 1/4 of an inch. - Add a pinch of Polyfill in between the top and bottom layers; sew around leaving about a 1/4 of an inch or less. - Using a fabric pen, draw down the middle of the lips to match the pattern and sew on the line. - Add a pinch of Polyfill in between the top and bottom eye layers; Sew around leaving about 1/4 of an inch. - Add a pinch of Polyfill in between the top and bottom layers; Sew around leaving about 1/4 of an inch. - Cut according to the pattern. 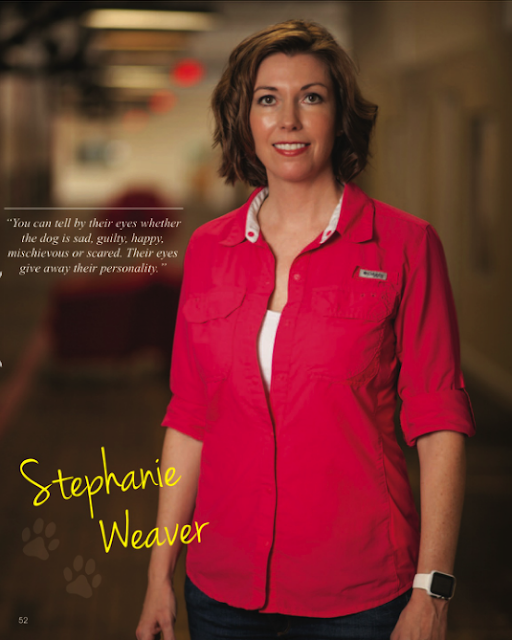 - Use 1/4-inch inseams throughout. - With Right sides together, sew the outer edge first. - Turn right side out, press and sew the inside rim. - Fold over the Side Band with right sides together and sew the edge. - Hat loops: Sew under all 4 edges of the 3 bands. - Pin the hat loops onto the right side of the side band 7 1/2" apart, starting at the seam. - Fuse interfacing to the side band lining. - Pin and sew the Side Band to the top of the hat lining, as you did previously with the outside Side band and top. - With Right sides together (ensure the brim is tucked in between the right sides), pin and sew leaving a 2-inch opening to turn everything right side out. - Pin close and top stitch around the base of the Side Band. - Place all of the previously made pieces into the hat to store. - Run a 1/4 of yard of rope through the three loops and tie and you are ready!!! I'd love to see your pictures, please send pictures of your snowman! 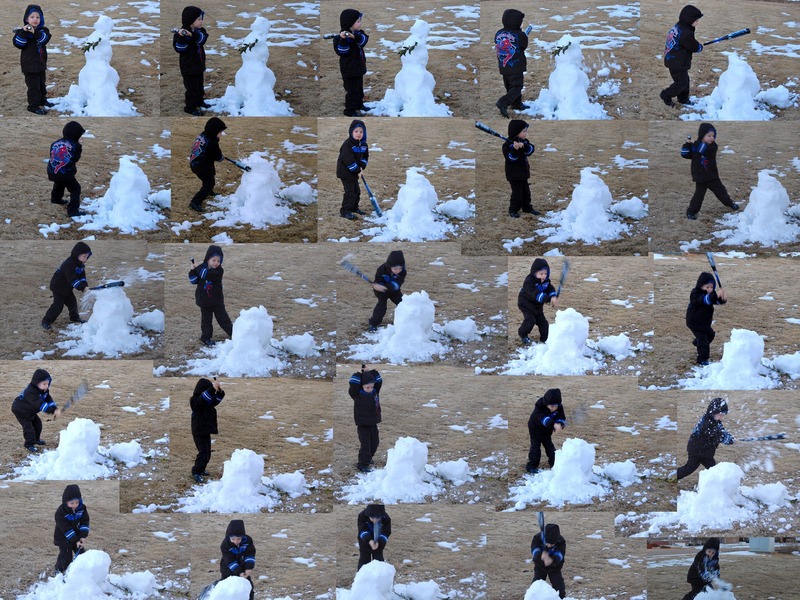 I can't believe a year has past since I took these pictures of our LilMan taking out the Snowman. The snowman made excellent swing practice!